DCP100 | A.M.S. Accuracy Management Services Ltd.
DCP100 Modeller Modeller creates automatically 3D reference model from the CAD object model. The reference model is created based on a knowledgebase created by the user. 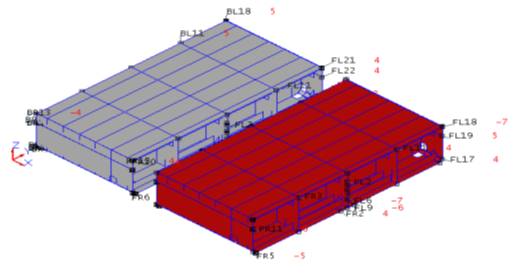 The reference model is utilized to support the measurements and analysis. DCP100 Analyzer Actual (measured) values are uploaded to Analyzer. Analyzer shows the Actual–Design deviations in 3D and 2D. It contains the basic calculation features for distortion analysis. It supports also the reporting functionality. DCP100 Simulator Simulator performs the computer simulation of two joining structures. Structures are automatically aligned. The optimal position of the Slave structure is observed. If excess material is used, simulator calculates the optimal amount of excess to cut. For more information please see Dcp100 Introduction and Dcp100 Training Manual. Or watch DCP100 introduction video.